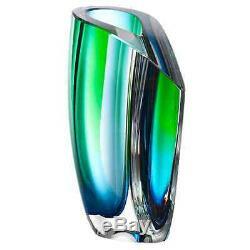 Kosta Boda Mirage Vase (Blue, Green, Large). The vases of Goran Warff's Mirage collection come in two different sizes Here, with the larger, sober colors - blue and green - harmonize subtly with the soft form of the vase, suggestion of an unexpected meeting between glass and color. The play of light within the glass adds an extra dimension to the mirage set in our imagination. H: 7 7/8" W: 0" Item# 7040703. The item "Kosta Boda Mirage Vase (Blue, Green, Large)" is in sale since Friday, May 27, 2016. This item is in the category "Pottery & Glass\Glass\Art Glass\Scandinavian\Kosta Boda". The seller is "jlhinterior" and is located in Brooklyn, New York. This item can be shipped worldwide.